Western blot analysis of Jurkat, MOLT-4, and Neuro-2a cells using BCAT1 (D6D4K) Rabbit mAb. BCAT1 (D6D4K) Rabbit mAb recognizes endogenous levels of total BCAT1 protein. 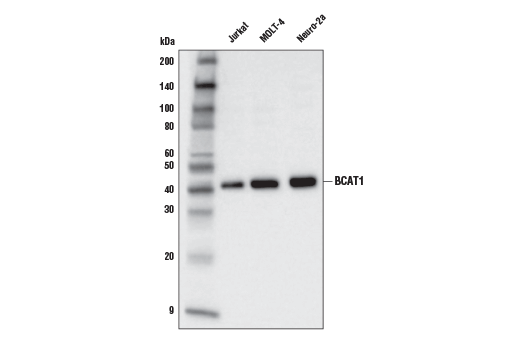 This antibody does not cross-react with BCAT2 protein. Monoclonal antibody is produced by immunizing animals with a synthetic peptide corresponding to residues near the amino terminus of human BCAT1 protein. BCAT1 and BCAT2 are cytosolic and mitochondrial branched chain aminotransferases, respectively (1,2). Research studies have implicated BCAT1 in distant metastasis in patients with advanced colorectal cancer (3). Disruption of BCAT2 in mice leads to higher levels of plasma branched-chain amino acids, reduced adiposity and body weight, and increased energy expenditure, suggesting its role in regulating insulin sensitivity (4). Bledsoe, R.K. et al. (1997) Biochim Biophys Acta 1339, 9-13. Suryawan, A. et al. (1998) Am J Clin Nutr 68, 72-81. Yoshikawa, R. et al. (2006) World J Gastroenterol 12, 5884-9. She, P. et al. (2007) Cell Metab 6, 181-94.